Personally, I’ve had four different frames throughout my 15 years of wearing glasses and wore each one until the end of their lifespan. My decision to take care of the frames was based on two reasons; first, my facial structure and clothing style worked well with the frames that I wore for years, and second, the cost of purchasing new frames is significant. What made me decide to purchase new glasses and prescription sunglasses? During my first time paddle boarding, I was wearing the prescription sunglasses that I purchased eight years ago for roughly $400 and I didn’t put on the glasses cords to hold it to my face. As I continued paddle boarding, a small wave threw off my balance and I landed in the water. Since the sunglasses were aviator style frames, they were snug to the sides of my head and were safe. A few minutes later, a series of larger waves came under my board and I flipped into the water. As I emerged, I saw my sunglasses quickly sinking beyond my reach into the darkness of the water. Fortunately, I had my glasses in my car and was able to drive home without a problem. Similar to my aviator sunglasses that I just lost, these glasses were from the Ray Bans brand with transition lenses and cost about $400. For that reason, I’ve owned these frames for 7 years and replaced the lens every other year. With the loss of my prescription sunglasses, I decided it was time for a new look and decided to buy both a new pair of glasses and prescription sunglasses. My decision to get new glasses is based on the following issues with my current pair. My Ray Ban frames are very thick and the lenses are large which make the glasses heavy. This leads to it falling off of my face when I look down and some pain on my left ear after more than 12 hours of constant wear. As I searched for new glasses and sunglasses, I set a few criteria that the new glasses would have to meet in order for me to feel comfortable making the purchase and the first step was finding the right company. For the past 2 years, I’ve been listening to lots of start-up and entrepreneur podcasts where the host tells personal stories, interviews established people, and has discussions with the founders of some of the fastest growing companies of the century. One of these podcasts, How I Built This, was an interview between the host, Guy Raz, and the founders of Warby Parker, Dave Gilboa and Neil Blumenthal which you can listen to by clicking here. During this interview, the founders of Warby Parker spoke about meeting in business school in college. Before starting business school, Gilboa accidently left his glasses on an airplane, which would’ve cost $700 to replace. In the interview, he compared the iPhone 3g that was new and provided a variety of features for $200 with the less technological pair of glasses that would cost $700. Gilboa would complain to all of his friends about the cost of plastic glasses being so high. One day, his friend, who constantly lost his glasses, vented to him and talked about the fact that he could purchase anything online except for glasses. After these discussions, Gilboa was with Blumenthal in a computer lab when Gilboa started asking questions related to selling glasses online. With Blumenthal’s background working at a non-profit glasses organization, he had experience designing glasses and he also had inside knowledge that one company owned almost all glasses companies! Suddenly, it was clear to the group that the reason why glasses cost so much is because one large company owns nearly all of the major glasses brands out there! So, they decided to start an online glasses business together as an alternative to the overpriced glasses market dominated by one company. What was their goal: to sell comfortable and fashionable glasses at an affordable price. With this, they set out to start Warby Parker that makes buying glasses online easy, fun, and affordable! Best of all, for every pair of Warby Parker glasses that’s sold the company will donate a pair of glasses to someone in need through non-profit organizations like VisionSpring. 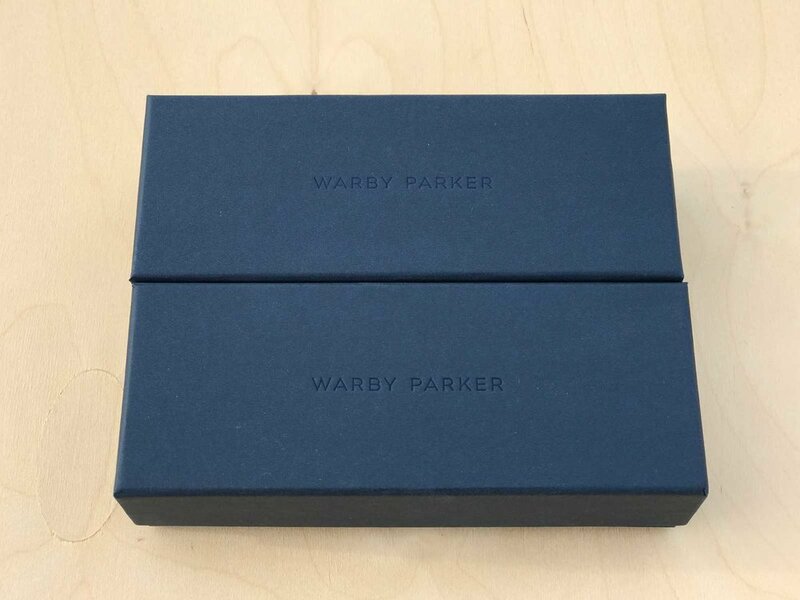 Here’s my story of purchasing glasses through Warby Parker based on 5 parameters. Similar to Gilboa’s story about losing his pair of glasses and his endless search for an affordable pair of replacement glasses, I followed this same journey after losing my prescription Ray Ban aviator sunglasses. Once I found Warby Parker’s online store, I browsed through their selection of frames. I was excited by the variety of frame shapes, sizes, and colors that they offered. Best of all, their website is intuitive and easy to filter through the various types of frames. Once I selected a handful that I thought would work with my facial structure and fashion style, I looked at each one and read through the description of each frame, the measurements, and materials. Most importantly, I found that the average price for their prescription glasses, both frame and lenses, was between $95 and $145! In the world of quality glasses, these are fantastic prices. Compared to a new pair of glasses from a typical brand name company, I would spend an average of $250 for the frame and an additional $125 to $150 for the lens. Ultimately, $400 is out of reach for a majority of people, but it’s important to be able to see the world with frames that fit your fashion sense and facial structure generally overrules the hefty price tag. This is especially true for people who wear glasses from the moment they wake up to the moment they fall asleep because it becomes a part of our everyday appearance! Similarly, prescription sunglasses generally cost at least $400, like the pair that I lost in the lake, which is out of reach for many people. With Warby Parker, I found a fantastic pair of sunglasses (check out Warby Parker's Sunglasses by clicking here) and when I was ready to place my order, the total was $225! This might sound like a lot of money, but for those of us who wear prescription glasses, this is a fantastic price. However, with Warby Parker, you can correct your vision with beautiful frames that fit your facial structure and fashion sense. With their wide variety of glasses, it’s nearly impossible not to find frames that fit you and are made of quality material. Another important parameter for finding my next pair of glasses was the quality of the frames and lens. Warby Parker offers glasses in 3 different types of materials: cellulose acetate (feels and looks like plastic), titanium, and mixed materials. A majority of glasses frames are made from cellulose acetate and is a popular material choice for many people. While searching for my next pair of glasses, I knew that I would wear them for at least the next 5 years. So, it was important for me to find durable frames that were similar in shape and size to my original Ray Ban glasses frames. I chose to get frames of the same material, cellulose acetate, in black and looked for a pair that had larger lenses. Once you’re ready to start selecting frames from Warby Parker, you can narrow your search for frames that qualify for their fantastic home-try on program. This was made for people like me who don’t live near a Warby Parker store that are interested in their glasses and want to try on their frames prior to making a purchase. This option is completely free (no shipping fees or down payments) and you can select up to 5 frames at a time. Best of all, you can take pictures of yourself wearing each frame, upload them to Instagram, tag Warby Parker, and they will let you know which frame suits you best! During this home-try on program, I selected 3 glasses and 2 sunglasses to try on and was pleasantly surprised by the quality and comfort of each pair. The material felt rigid enough to maintain its shape and durable enough to withstand a fall. I also found that this program was an essential part to making my purchase because some of the frames were either larger or smaller than I envisioned. You can see in the photographs that the sunglasses were a little too large for my face and one of the glasses was too narrow. This home-try on program took two tries for me to find the right frames for my glasses and sunglasses. Each shipment included 3 glasses frames and 2 sunglasses frames. Fortunately, I tried on two of their aviator sunglasses in my second shipment and found that they were a lot smaller than they appeared on the model on the Warby Parker website. However, I found a larger pair of aviators and I’m very happy about my purchase. Once I had the home-try on box in hand and felt the frames for their quality, the next step was to put them on and feel how they fit on my head. My previous Ray Ban glasses had thick frames that were oversized and heavy on my nose and ears. In addition, the Ray Ban frames didn’t make contact with the temple on the sides of my head. This led to a lot of pressure over my ears and actually irritated and scratched the top of my left ear where the frames would rest. So, it was important to find a pair of glasses frames that would be light enough to rest on my nose, ears, and make contact with my temples for some additional support through friction. Most of all, the frames had to be comfortable to wear for a duration of time and have large lenses to fit my style and provide a larger viewing area. After trying on all of the frames, I was between 2 different frames and decided to purchase the Crane frames, which I found to be the most comfortable and thinnest. The Crane frame is also very light and thick enough to be rigid and durable. All of Warby Parker’s frames that I’ve seen on their website and tried on at home were beautifully designed. Everyone who wears glasses for either correcting their vision or as a part of their fashion knows the importance of the design of the frames. Every aspect of the glasses or sunglasses frame makes an impact on the overall appearance of a person. Think about it. When you meet and greet anyone who wears glasses, you spend a lot of time engaging in eye contact as you converse. So, it only makes sense that the frames you choose should represent you! If you simply scroll through Warby Parker’s glasses and sunglasses collection, you’ll quickly find that they cover a wide spectrum of fashion styles and aesthetics. They have a variety of glasses that have fashion sensibilities from an earlier time period like the circle lenses. Then, they have all of the standard shaped glasses that people have worn for centuries. Finally, they carry a full spectrum of contemporary frames that represents today’s trends and fashion senses. Every few months, I get an email from Warby Parker about new frames of the season that are beautifully designed. Check out their summer style here! When I finally made my decision to go with Warby Parker for my new pair of glasses and sunglasses, I was so surprised by their customer support representatives and programs to help me find the right frames, trouble shoot issues that I had, and ultimately provide me with the perfect pair of glasses and sunglasses. Here’s a short version to my long journey of obtaining my final pair of Warby Parker glasses and sunglasses with some advice for you along the way. After I ordered my first home-try on box of 5 frames, I made an appointment with my optician to get my eyes checked and for a prescription to upload to my account with Warby Parker. By the time I saw my optician, I was already trying on my second box of glasses. So, I uploaded my prescription to my account and made my frame selection for both my glasses and sunglasses. Once I placed the order, I received an email of their receipt and another when the glasses were shipped. Every day, I tracked the shipment, which was free from Warby Parker, and finally received it in the mail about 5 days later. My first shipment was the glasses, which I promptly took out of the box and tried on. To my surprise, the left lens of the glasses felt overpowering and made it difficult to focus on anything for a short amount of time. So, I contacted their customer support through their online chat system and they quickly responded to my questions. They had one of their opticians contact me to go over some of the problems. After a 5 minute phone call, the Warby Parker optician thought it was their fault and expedited a new shipment of my glasses. A few days later, I received the glasses and had the same problem! This time, I let the Warby Parker representative know about the issue and told them that I would bring it to my optician to check the lens. We figured out that the issue was the prescription that my optician wrote – my left eye should’ve been -2.75 and he wrote -3.75 – and he promptly called Warby Parker to let them know that the prescription was incorrect. From here, the Warby Parker representative re-ordered my glasses and sunglasses and expedited the orders so that I would finally get my glasses with the correct prescription! All of this back and forth took about a month, but at the end of the day, it cost me absolutely nothing to exchange. After this experience with Warby Parker from their home try-on program to their customer service, I could never see myself purchasing glasses from anywhere else. It’s clear that the company probably didn’t make much of a profit from my order; especially because they sent me a total of 3 glasses and 1 pair of sunglasses that were exchanged for my final pairs! What other glasses company would go this far for a customer? Being one of hundreds of millions people around the world who suffer from vision impairment, I understand the importance of having a great pair of glasses that are well designed, comfortable, made of quality material, and most of all, affordable. 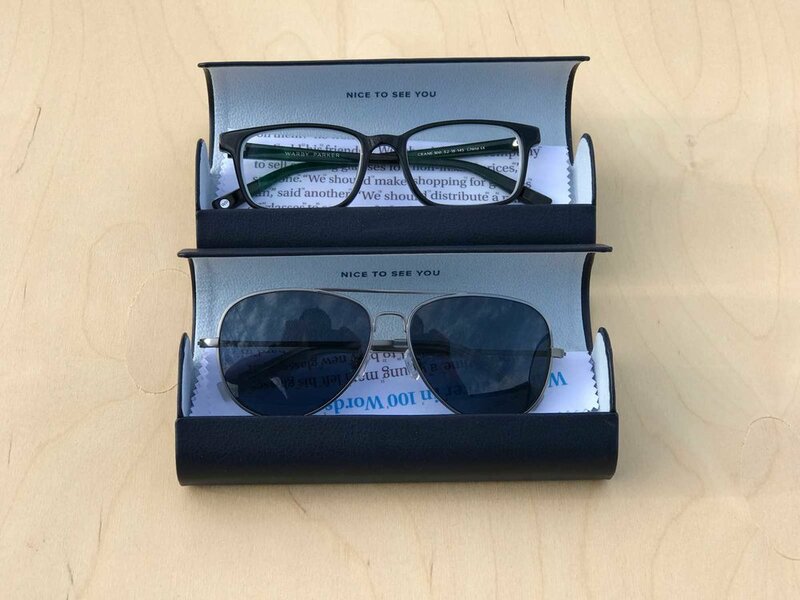 Through my experience with Warby Parker, I now have a greater appreciation for companies that care about their customers and go above and beyond to service them until their order is perfect. Most importantly, I can say that in some small way, I’ve contributed to providing a pair of prescription glasses to someone in need. In the future, I'd like my company to emulate this level of customer service and contribute to a larger cause. When you’re ready for your next pair of prescription or non-prescription glasses and sunglasses, make sure you check out Warby Parker. I hope your experience is less eventful, but as great as mine!